In 1926, at the suggestion of a Serbian toy merchant in Paris, Calder began to make mechanical toys. A visit to Piet Mondrian's studio in 1930, where he was impressed by the environment-as-installation, "shocked" him into fully embracing abstract art toward which he had already been tending. This shock changed the course of modern art by developing an innovative method of sculpting, bending, and twisting wire to create three-dimensional “drawings in space”. Resonating with the Futurists and Constructivists, as well as the language of early nonobjective painting, Calder’s mobiles consist of abstract shapes made of industrial materials –often poetic and gracefully formed and at times boldly colored –that hang in an uncanny, perfect balance. Later in his career, Calder devoted himself to making outdoor monumental sculptures in bolted sheet steel that continue to grace public plazas in cities throughout the world. With his earlier Calder's Circus, Calder injected wit into serious art and introduced the concept of the artist as a performer as much as a maker of art, inspiring other artists. In addition to sculptures, Calder painted throughout his career, beginning in the early 1920s. As Calder’s sculpture moved into the realm of pure abstraction in the early 1930s, so did his prints. The thin lines used to define figures in the earlier prints and drawings began delineating groups of geometric shapes, often in motion. The influence of the sweeping linear gestures in Calder's mobiles and drawings can be seen in the work of Abstract Expressionists Franz Kline, Willem de Kooning and the later Jackson Pollock works. The mobile introduced the elements of movement and of random chance composition into sculpture, setting the stage for experiments with the kinetic art of George Rickey and music and dance composed by chance operations of John Cage and Merce Cunningham. Calders’ work is included in all major museums and private collections. 2017 Mayoral Galeria d'Art, Biennale des Antiquaries, Grand Palais, Paris. Art Revolutionaries. Homage to the Pavilion of the Spanish Republic, 1937. 2017 Louisa Guinness Gallery, London. The Boldness of Calder. 2015 Pushkin Museum, Moscow. Alexander Calder: Retrospective. 2015 Fondazione Vedova, Venice. Frammenti Expo '67: Alexander Calder e Emilio Vedova. 2015 Museo Jumex, Mexico City. Calder: Discipline of the Dance. 2014 Rijksmuseum, Amsterdam. Alexander Calder at the Rijksmuseum. 2014 Museum of Contemporary Art, Chicago. MCA DNA: Alexander Calder. 2010 Palazzo delle Esposizioni, Rome. Calder: Sculptor of Air. 2009 Musée National d'Art Moderne, Centre Georges Pompidou, Paris. Alexander Calder: les années parisiennes 1926–1933. 2008 Philadelphia Museum of Art. Calder Jewelry. 2008 The Museum of Modern Art, New York. Focus: Alexander Calder. 2001 Museum of Contemporary Art, Chicago. Alexander Calder in Focus. 2001 Museum of Art, Kochi, Japan. Alexander Calder: Motion and Color. 1999 Whitney Museum of American Art, New York. Alexander Calder. 1998 Fundació Joan Miró, Barcelona. Calder. 1992 Whitney Museum of American Art, New York. Celebrating Calder. 1992 Royal Academy of Arts, London. Alexander Calder. 1992 IVAM, Centre Julio Gonzalez, Valencia, Spain. El Universo de Calder. 1993Musée Picasso, Château Grimaldi, Antibes, France. Calder: Mobiles, stabiles, gouaches, bijoux. 1990 Cooper-Hewitt National Design Museum, Smithsonian Institution, New York, The Intimate World of Alexander Calder. 1987 Whitney Museum of American Art, New York. Alexander Calder: Sculptures of the Nineteen Thirties. 1983 Musée National d'Art Moderne, Centre Georges Pompidou, Paris. Des Stabiles et des Mobiles de Calder. 1979 Prefectural Museum of Modern Art, Kobe, Japan. Calder's Universe. 1978 Israel Museum, Jerusalem. Homage to Calder. 1978 American Academy and Institute of Arts and Letters, New York. 1978 Alexander Calder: Memorial Exhibition. Moderne, Centre Georges Pompidou, Paris. 1976 Whitney Museum of American Art, New York. Calder's Universe. 1974 Museum of Contemporary Art, Chicago. 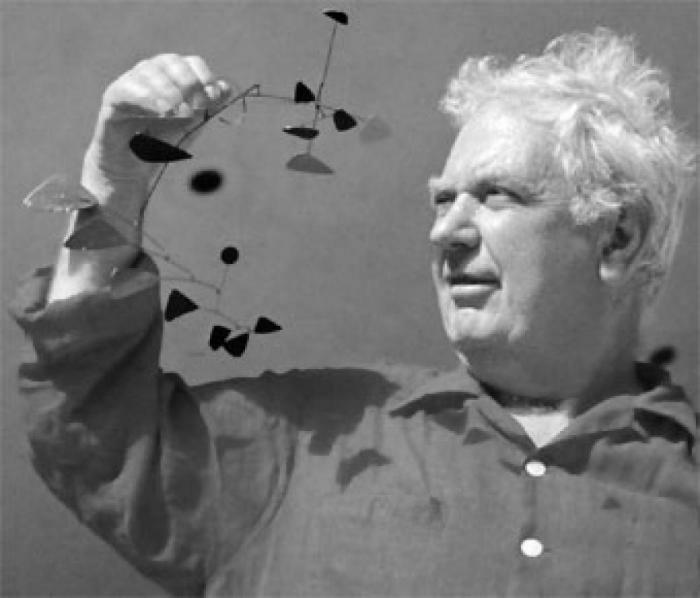 Alexander Calder: A Retrospective Exhibition, Work from 1925–1974. 1973 Solomon R. Guggenheim Museum, New York. Calder Airplanes. 1972 Whitney Museum of American Art, New York. Calder's Circus. 1971 Musée Toulouse-Lautrec, Albi, France. Calder. 1970 The Museum of Modern Art, New York. A Salute to Alexander Calder. 1967 The Museum of Modern Art, New York. Calder: 19 Gifts from the Artist. 1965 Musée National d'Art Moderne, Paris. Calder. 1962 Arts Council of Great Britain, Tate Gallery, London. Alexander Calder: Sculpture–Mobiles. 1959 Stedelijk Museum, Amsterdam. Alexander Calder, Stabilen, Mobilen. Also in Kunsthalle Mannheim, Germany. Haus der Jugend, Wuppertal-Barmen, Germany. Palais des Beaux-Arts, Brussels. 1956 Musée Picasso, Château Grimaldi, Antibes. Gouaches–Dessins–Mobiles de Calder. 1952 Venice. XXVI Biennale di Venezia. 1950 Stedelijk Museum, Amsterdam. Alexander Calder. 1950 Institute of Contemporary Arts, Washington, D.C.
1948 Museu de Arte Moderna, Rio de Janeiro, Ministerio da Educaçao e Saude, Rio de Janeiro. Alexander Calder São Paulo, Brazil. 1945 San Francisco Museum of Art. Alexander Calder: Watercolors. Whitney Museum of American Art, New York, USA. Solomon R. Guggenheim Museum, New York, USA.